Mrs. Renne has taught Orchestra at every level of the Bellefonte Area School district for the past 10 years. Originally from Cleveland, OH, Mrs. Renne studied music education and piano performance at Kent State University. 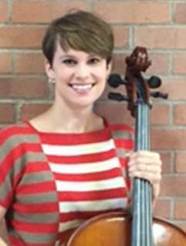 Mrs. Renne is a member of the American String Teachers Association (ASTA), the Pennsylvania Music Educator's Association (PMEA) and National Association for Music Education (NAfME). Mrs. Renne lives in State College with her husband Mike, daughter Evie, fish Cookie and cat Lyric. In her spare time, Mrs. Renne enjoys playing with her daughter at home and cooking. The Bellefonte Area School District's Orchestra program offers instruction on the violin, viola, cello and string bass to a diverse range of students from fourth grade to twelfth grade. The orchestra program began in 1981 with the goal of promoting music education through the performance of string instruments. Over the years, the orchestra program has been able to maintain that goal and has steadily grown in student participation. The students have the opportunity to participate in several concerts each year, out-of-state festivals, as well as PMEA music festivals. The orchestra program is currently under the direction of Mrs. Diane Silvis (Benner, Bellefonte, Marion-Walker and Pleasant Gap Elementary Schools) and Mrs. Julie Renne (Middle School and High School).